Do you know the ideal blood pressure rate for your child? 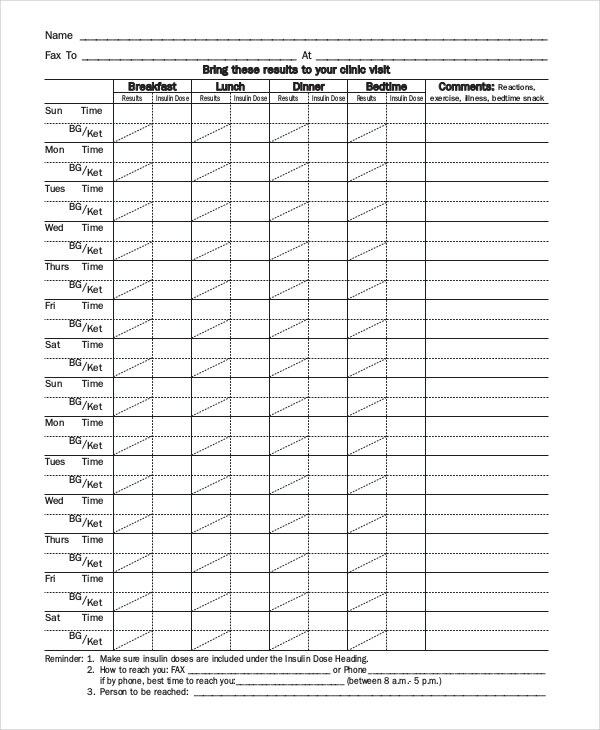 Download these Child Blood Pressure Chart Templates and start recording the readings today according to your kid’s height, weight, and gender. The BP tables are very easy to work with and also to provide to your clinician. View the sample formats. Are you suffering from High Blood Pressure? 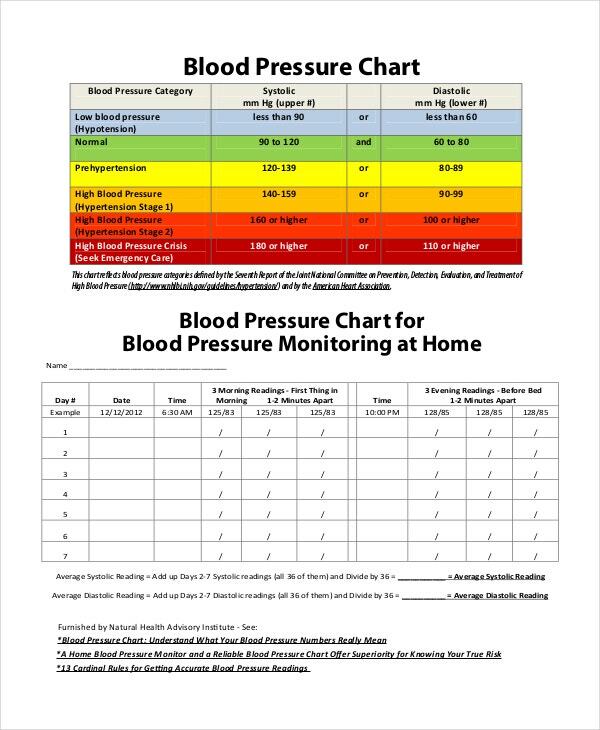 These High Blood Pressure Chart Templates help you reduce your hypertension to normal levels. Get your readings evaluated by your clinician and further decide about the suitable treatment you may be needed. Let these templates be the first step to the change. Generally, healthy people are having a blood pressure below 120 over 80. At this level, people have a sparse risk of heart diseases. 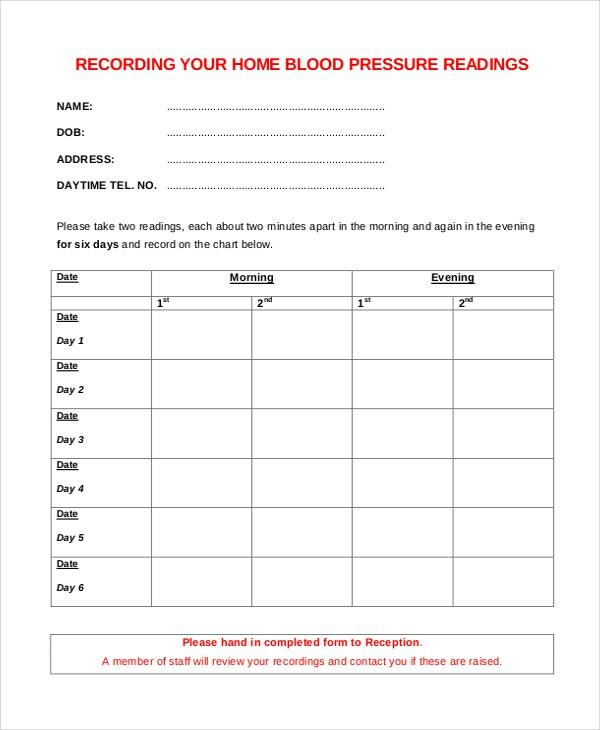 These Normal Blood Pressure Chart Templates help you keep the blood pressure levels in control. 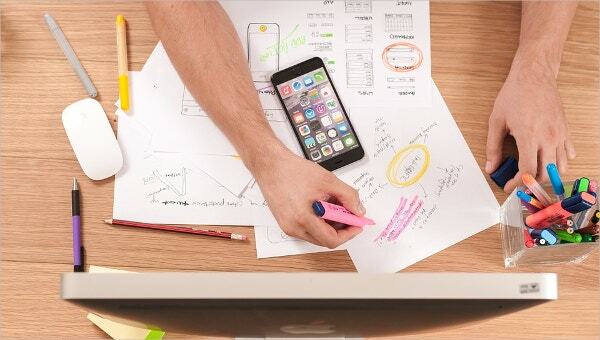 Any changes you want to do can be imbibed there and then. If the readings dipped down from the normal 90 over a period, then it is considered to be the low blood pressure. 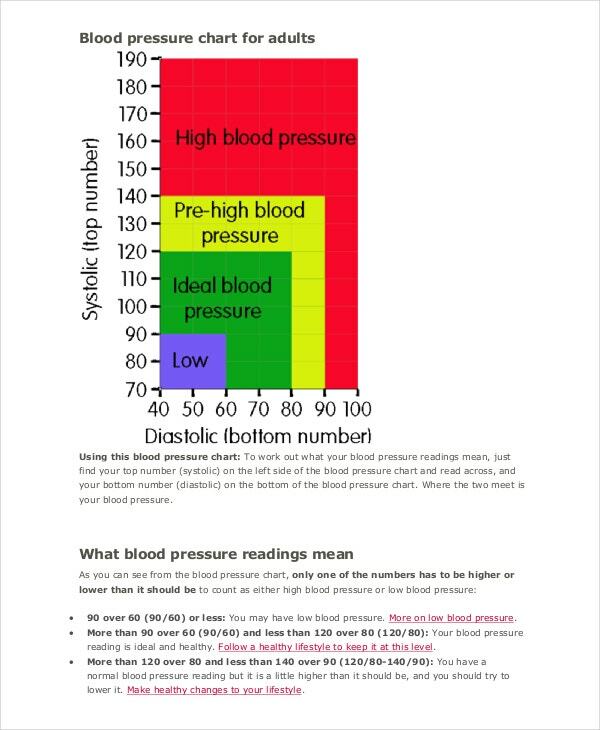 The Low Blood Pressure Chart Templates help you handle the hypotension. They are the embankments you can rely on. Put a check to hypotensive crisis using these templates. About 80 million U.S. adults have been diagnosed with high blood pressure. This speaks volumes about the abundant rise of BP patients. The American Blood Pressure Chart Templates draws some conclusions about your blood pressure levels and brings to your notice, in the case of abruptness. They can be seen as an excellent solution to your hypertension and hypotension. Pregnant ladies should be much more conscious about their health than normal women. 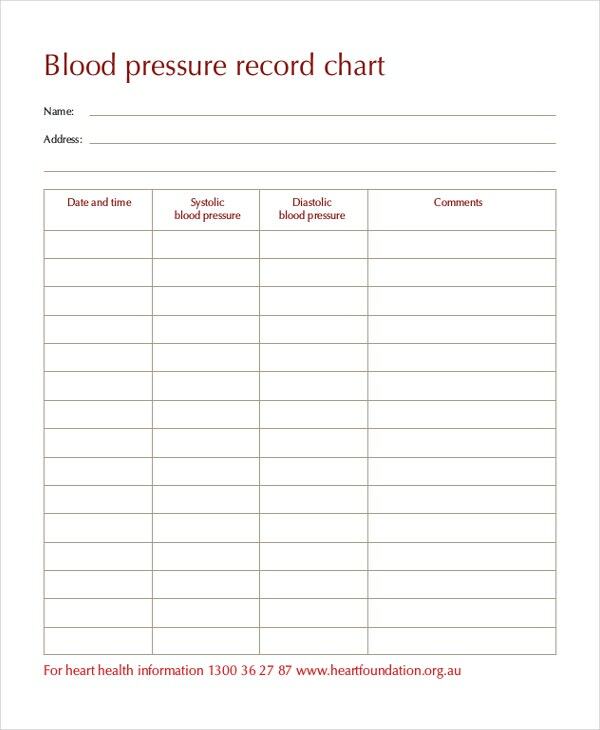 The Pregnant Blood Pressure Chart Templates track the blood pressure levels meticulously. Because what’s normal for you could be different from other mums-to-be. Get on the path of managing your blood pressure. 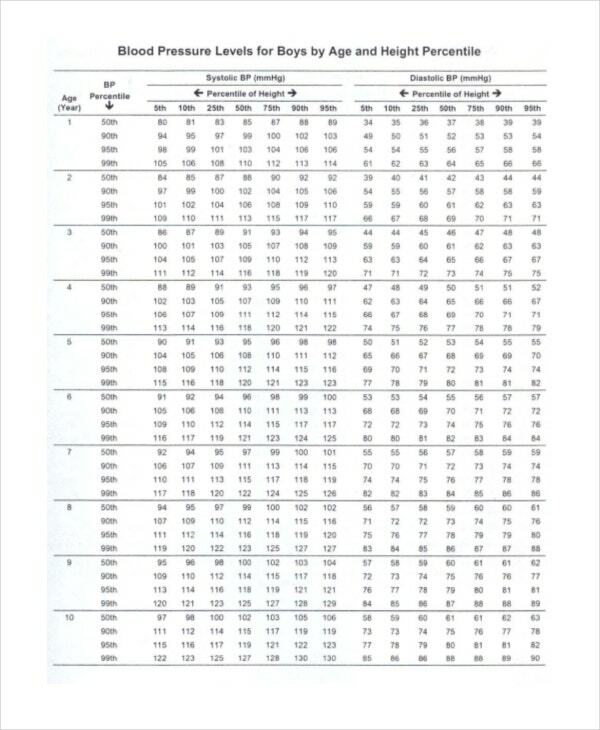 You may also see Body Fat Charts Female. As discussed in the above section, comparing your BP levels with those of others may not be a wise practice. The Blood Pressure Chart Template by age and weight and gender templates capture the variations in BP for bot children and adolescents as well. Bring back your blood pressure levels to normal with these. 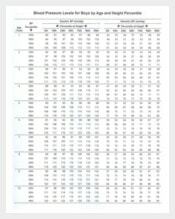 You may also see Body Fat Charts Templates. 40 is the age when health issues start to arise. And Blood Pressure is inarguably one among them. As many doctors say, prevention is better than cure. The Blood Pressure Chart for elderly templates is designed in this regard for senior citizens. 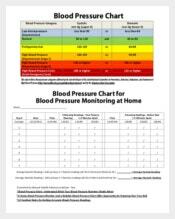 Start controlling your blood pressure with the BP chart for the elderly template. As per a study, 30% of the Australians over the age of 25 are having high blood pressure. If you happened to be one among them, it’s high time to take care of your health. Because high blood pressure affects the blood flow to your organs and gradually, this increases your chances of developing heart disease. You may also see Reflexology Chart Templates. Blood Pressure levels vary from men to women. With these Blood Pressure Chart for Women templates, it is very easy to notice high, normal, and low blood pressure levels. They let you know when the medical intervention is needed. Download them now to know whether or not you are in healthy numbers? > What is a Good Blood Pressure Level? As mentioned above, for adults who are over 20, the ideal blood pressure rate should be somewhere less than 120/80. A good BP level leads to a healthy lifestyle and reduces the risk of the heart disease. If your blood pressure levels are above normal or high, try to reduce them in its initial stages itself. > What Should Your Blood Pressure Be? Your blood pressure readings mean a lot to your health. Though the blood pressure levels vary when you exercise and are under stress levels, it falls under somewhere 120 over 80 and less than 140 over 90 on a normal basis. Also, the BP reading varies from one posture to another. You may also see Medication Chart Templates. > What is Normal Blood Pressure for Men Over 40? For quadragenarians or for those who are in the 40s, the normal blood pressure levels range from 125/83 to 127/84. For men between the age group of 40-44 years, the minimum blood pressure level is 112/79. The same moderates to 127/84 for those between 45-49. However, if we follow a healthy lifestyle, it would not be difficult to keep the uninvited problems at a bay. > What is Blood Pressure? The pressure of the blood that flows in the circulatory system is called blood pressure. Extreme variations in Blood Pressure can affect the heart beat and the arterial walls’ diameter. 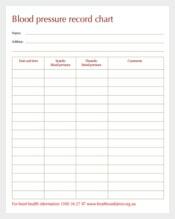 You may also see Weight Loss Chart Templates. > What is Systolic Blood Pressure? While recording the Blood Pressure the upper part or the numerator is called as systolic blood pressure and the lower part or the denominator is called as diastolic blood pressure. In this process, systolic blood pressure always gains more importance as it is always higher than the denominator. Systolic Blood Pressure measures the pressure in the arteries.